Pictured above: Sepho, Phyonggang, and Ichon Counties. These three counties are home to the Sepho Tableland Project. Pyongyang, April 2 (KCNA) — A memorandum of understanding on setting up the DPRK-Mongolia friendship joint company between the DPRK and Mongolian governments was inked here on Wednesday. Present at the signing ceremony from the DPRK side were Ri Ryong Nam, minister of Foreign Trade who doubles as chairman of the DPRK side to the Inter-governmental Committee for Consultation in Economy, Trade, Science and Technology between the DPRK and Mongolia, Hwang Min, vice-minister of Agriculture who is also chairman of the Livestock Management Committee in Sepho Area, and officials concerned and from the Mongolian side were Mongolian Minister of Industry and Agriculture Khaltmaa Battulga who is chairman of the Mongolian side to the Inter-governmental Committee for Consultation in Economy, Trade, Science and Technology between the DPRK and Mongolia and his party and Manibadrakh Ganbold, Mongolian ambassador to the DPRK, and his embassy officials. A MOU was also signed between the Ministry of Foreign Trade of the DPRK and the Ministry of Labor of Mongolia. Pyongyang, November 9 (KCNA) — Premier Choe Yong Rim learned about the preparations for creating vast grass field in Sepho, Phyonggang and Ichon counties of Kangwon Province and turning it into a large-scale stockbreeding base of the country. The creation of vast grass field in the counties covering tens of thousands of hectares and the construction of combined processing base for livestock products will bring about an epochal turn in carrying out the party’s policy of improving the standard of people’s living by massively breeding grass-eating domestic animals. Generalissimos Kim Il Sung and Kim Jong Il gave instructions to Sepho County several times on developing stockbreeding suited to climatic, natural and topographical conditions, while making continued journey of guidance for people’s happiness. The dear respected Marshal Kim Jong Un unfolded a plan for transformation of Sepho tableland, true to the intention of the great Generalissimos and brightly indicated the orientation and ways for realizing it. The premier first learned about the vegetable produced in part of the reclaimed Sepho tableland, looking round the field of a sideline farm of a unit of the Korean People’s Army. Then, he acquainted himself with the area of reclaimed grass field and soil condition in Sepho County in Songsan area of the Sepho tableland. A consultative meeting of senior officials of party, state and army was held on the spot. The participants were briefed on a huge map showing the panoramic view of the field. The meeting discussed the goal of reclaiming grass field in Sepho, Phyonggang and Ichon areas and building stockbreeding base and the issue of providing labor, raw materials and equipment necessary for its reclamation and construction. The meeting called on all the units to channel efforts into achieving the goal of creating grass field and reclaiming and building stockbreeding base in Sepho, Phyonggang and Ichon areas. The goal reflects the far-reaching plan and unusual wisdom of the Marshal. Practical issues including the work for keeping the designing ahead of the project and providing raw materials and equipment under a plan were discussed and relevant organization of work was made at the meeting. The premier, concluding the meeting, called on officials and builders to carry out the behests of Kim Il Sung and Kim Jong Il and certainly realize the noble intention of the Marshal to create the socialist fairyland in Sepho, Phyonggang and Ichon areas. The Mongolian government ratified a cooperation agreement Friday with the Democratic People’s Republic of Korea (DPRK) in the areas of industry and agriculture. Under the agreement, Mongolia will provide livestock husbandry support to the DPRK and, in return, the DPRK will develop light industry using raw materials and resources of Mongolia, such as sheep wool and coal. The agreement was finalized during a visit by Battulga Khaltmaa, Mongolian minister of industry and agriculture, to the DPRK last October. Both countries hope the deal will expand reciprocal economic ties between the two countries. Mongolia is rumored to be involved with the DPRK’s Sepho Tableland project. North Korea’s telecommunications challenges are a headache for business, too. Foreigners are able to get 3G on their phones, but it is expensive. International calls are possible but equally pricey. “When telecommunications become a little more open that will indicate the seriousness of purpose,” says Andray Abrahamian, who directs Choson Exchange, a Singaporean nonprofit that focuses on business and legal training for young North Koreans in the DPRK. Abrahamian has been watching North Korea for a decade and visited Rason several times. He says things are finally moving, a result of legal changes made in 2010 that helped make Rason more autonomous. Further legal changes two years ago were intended to harmonize Rason’s economic laws with those of China, he says. “The degree to which [Pyongyang] will allow autonomy to the regional decision makers or local planners has yet to be seen. That’s a key issue for Rason–how autonomous are these places really?” asks Abrahamian, 36. “Chinese small and medium-size enterprises, from Jilin Province but also Heilongjiang Province, are continuing to come in–Rason is experiencing growth,” says Abrahamian. Not all the factories are new. The Rajin Garment Factory was built in 1958, long before talk of special economic zones. In the early days it produced school uniforms for North Korean students. After 1991 it took orders from China and today employs 180 staff. The factory manager stands on the front steps. It’s early evening, and he’s watching a staff volleyball game in the car park. Has business improved since Rason was made a special economic zone? The tag is written in English, and the woman packing the jackets doesn’t understand the visitors’ raised eyebrows. Apparently this is a common practice. It’s noisy on the factory floor. The popular all-girl band Moranbong blasts out of speakers, drowning out the whir of sewing machines. It’s impossible to hear the drone of the generator, switched on after yet another power failure, a regular feature of life in the DPRK. There is a deal in place to bring power from Jilin Province, but the Chinese have been holding it up using the pretext of an environmental impact study. Another matter is fuel. Joseph Naemi is director of HBOil, an oil trading and refining company based in Ulaanbaatar, Mongolia. HBOil grabbed a few headlines in June when it was reported the firm had acquired a 20% stake in Sungri oil refinery in Rason. That was premature, says Naemi: HBOil has 20% of a state-dominated joint venture called Korean Oil Exploration Corp. International, and a formal commitment with Sungri has yet to be made. Another option is to invest in a refinery on the west coast of the DPRK. “The easy option is Sungri oil refinery because it’s based on Russian technology and because of its location in terms of the dynamic state of affairs in Rason Special Economic Zone. We are conducting engineering assessment of the refinery to determine the various phases of upgrading and expanding–it’s a work in progress,” says Naemi. Describing Rason officials as well educated and smart, he says they understand issues of foreign investment protection, taxation and the need to not only be fiscally transparent but also to offer attractive terms to investors. “I know a number of Mongolian companies, all privately owned, that are at various stages of either investing in North Korea or finalizing their joint ventures so that they can invest. There is a robust relationship between Mongolia and North Korea,” says Naemi. For anyone doing business, there will be surprises. Standing on the terrace of the new brewery, Novotny looks out at the recently planted lawn. The seeds have been planted in rows, five centimeters apart, all the way down to the sea. Come summer and the warmer weather, the grass should have taken. It stands to be a great spot for a bar. Pyongyang, October 28 (KCNA) — An agreement on cooperation in the fields of industry and agriculture and an agreement on cooperation in the fields of culture, sports and tourism were signed here on Monday between the governments of the DPRK and Mongolia. Present there from the DPRK side were Kim Yong Nam, president of the Presidium of the DPRK Supreme People’s Assembly, Pak Ui Chun, minister of Foreign Affairs, Ri Ryong Nam, minister of Foreign Trade, Kim Jong Suk, chairwoman of the Korean Committee for Cultural Relations with Foreign Countries, Pak Kil Yon, vice-minister of Foreign Affairs, Kwak Il Ryong, vice-minister of Land and Maritime Transport, Hong Kyu, DPRK ambassador to Mongolia, Jong Song Chan, vice general director of the General Bureau of Software Industry of the DPRK, and officials concerned. Present from the Mongolian side were Mongolian President Tsakhiagiin Elbegdorj, Luvsanvandan Bold, minister of Foreign Affairs and Trade, Manibadrakh Ganbold, Mongolian ambassador to the DPRK, Khaltmaa Battulga, minister of Industry and Agriculture, Tsagaandari Enkhtuvshin, secretary general of the National Security Council, Tserendejid Byambajav, chief of the General Staff of the Armed Forces, Khabshai Erjan, vice-minister of Road Transport, Lundeg Purevsuren, national security and foreign policy advisor to the President, Amgalanbaatar Ganbaatar, advisor for mass liaison and mass policy to the President, Pureb Altangerel, secretary of state for the Ministry of Culture, Sports and Tourism, officials concerned and staff members of the Mongolian embassy here. The agreement on cooperation in the fields of industry and agriculture was inked by Ri Ryong Nam, minister of Foreign Trade, and Khaltmaa Battulga, minister of Industry and Agriculture, and the agreement on cooperation in the fields of culture, sports and tourism by Kim Jong Suk, chairwoman of the Korean Committee for Cultural Relations with Foreign Countries, and Luvsanvandan Bold, minister of Foreign Affairs and Trade, on behalf of the governments of the DPRK and Mongolia. Meanwhile, the 2013-2015 plan for exchange in the IT field between the General Bureau of Software Industry of the DPRK and the IT, Post and Telecommunication Bureau of Mongolia was signed. 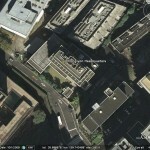 Pictured above (Google Earth): The Chongryon headquarters building in Tokyo ( 35.697001°, 139.743435°). The building and the land it stands on are mortgaged to a Chongryon-affiliated company on whose board sit a former member of the Supreme People’s Assembly of North Korea and a former president of Korea News Service, a North Korean news agency, people familiar with the situation said. Records show ownership of the building and land was transferred to a real estate firm in Sakata, Yamagata Prefecture, on Jan. 28 from a real estate company in Takamatsu, Kagawa Prefecture, which place the successful auction bid. The fact that the property is mortgaged to a Chongryon-affiliated company suggests the organization played a role in shifting ownership to the Sakata real estate firm, people close to Japanese public security authorities said. The Sakata real estate firm is expected to lease the property to Chongryon so that it can continue using the building, informed sources said. A former Chinese diplomat once named as a spy in Japan’s parliament has business links to an obscure firm that has purchased the de facto North Korean embassy in Tokyo. Wang Xinghu, who was previously stationed at the Chinese embassy but claims to have become a businessman, has set up a consultancy called HKS Japan with Takeharu Inamura, a Japanese national, according to records seen by the South China Morning Post. It emerged last week that Inamura’s other company, a small warehousing firm that is called Green Forest, paid ¥4.4 billion (HK$290.7 million) to buy Pyongyang’s biggest asset in Japan, the headquarters of the quasi-official Chongryon organisation. But Green Forest has limited resources and experience in the property sector, and questions are being asked about where the firm acquired the cash. Chongryon’s imposing headquarters was initially put up for auction in 2012 at the request of the Japanese government’s debt collection agency after the association for North Korean residents of Japan defaulted on debts of more than ¥62 billion. After two initial attempts to purchase the building fell through – one by a religious group with links to an organised crime gang with North Korean members and the second a shell company based in Mongolia but with no assets and no traceable history – the property was sold last year to Marunaka Holdings, a Japanese construction company. After paying ¥2.21 billion for the building and demanding that Chongryon vacate it so the plot could be redeveloped, Marunaka suddenly changed its mind and sold the property – for ¥4.4 billion and a swift profit – to Inamura’s company, which is based in rural Yamagata Prefecture, has no history or licence to operate in the real-estate sector. Its annual turnover is a paltry ¥19 million. In corporate documents, Chongryon is now listed as the mortgagee and will be allowed to remain in the property. The sale took place on January 28. Phone calls to the offices of both HKS Japan and Green Forest were not answered. Local media have reported that Inamura lives in a small rented apartment in Tokyo’s Nakano district, but the curtains have remained drawn and the lights off since the deal was revealed. Wang – who was named by Japanese politician Katsuei Hirasawa in the Diet in July 2012 as a Chinese spy – is apparently out of the country. Hirasawa is a former official of the Japanese police whose responsibilities primarily focused on foreign intelligence issues. At the time Hirasawa made his allegations, the Sankei Shimbun reported Wang was a member of to China’s Ministry of State Security. Chongryon is also refusing to talk to the Post. A Japanese human rights activist who is demanding that more international pressure be applied to the North Korean regime says he believed China was involved in the transaction. “Wang cannot fund the Chongryon headquarters deal without the consent and financing of the Chinese government,” claimed Ken Kato, director of Human Rights in Asia and a member of the International Coalition to Stop Crimes Against Humanity in North Korea. “It is a mystery why China has decided to spend billions of yen to save Chongryon’s face,” he added. “I am sure that China understands that once their involvement in the deal is revealed, it will anger the Japanese public. Kato is indignant North Korea is refusing to honour its debts in Japan despite spending vast sums on nuclear and ballistic missile programmes. There have been several years of friction between China and erstwhile ally North Korea, and if Beijing funded the purchase of the building, it could be a sign that China wants to get the relationship back on track. Beijing was angered when Pyongyang ignored its pressure to not go ahead with a third underground nuclear test in 2013 and, subsequently, a series of missile test-launches. Since Beijing got tough on the regime of Kim Jong-un – including halting all supplies of fuel oil – North Korea turned its attentions to Russia and has been busily courting its new ally. Moscow and Pyongyang have agreed to carry out a series of military drills this year, major Russian investment in North Korean infrastructure is under way, and Kim has reportedly accepted an invitation to attend a ceremony marking the end of the second world war in Moscow in May. Chongryun, the association that represents North Korean residents of Japan, is running out of ways to keep its most prized asset after the Supreme Court ruled that the sale of its headquarters to a Japanese real estate developer would go ahead. The dismissal of the appeal by Chongryun represents “a serious loss of face” for the organisation and the North Korean leadership, according to analysts, and could even serve to weaken links between the regime’s citizens in Japan and their homeland. “They have not made any official comments yet but it is clear that this will be a major disappointment because it is such a serious loss of face,” Ken Kato, a Tokyo-based human rights activist, said. Representatives of Chongryun could not be contacted but sources said last month that retaining a building that served as an embassy in Japan had been made a priority by North Korean leader Kim Jong-un. Chongryun leader Ho Jong-man visited North Korea for the first time in eight years in October and, although he was not able to meet him in person, was handed a personal letter from Kim. One of the instructions in the letter was to secure the continued use of the Chongryun headquarters in Tokyo. The Supreme Court’s decision makes that target effectively impossible and will not go down well in Pyongyang. The legal decision is in favour of Marunaka Holdings, which had lodged a bid of 2.21 billion yen (HK$149.5 million) for the building and the prime 2,387 square metre plot that it occupies in Chiyoda Ward. Moves to sell the building began in March after the government-backed Resolution and Collection called in loans amounting to more than 62 billion yen that it had extended to the residents’ association. Chongryun initially attempted to sell the property to a Kagoshima-based religious order that would permit the organisation to remain in residence. It was later alleged that the temple had links to underworld groups. The deal fell through when the temple was unable to raise the funds. The next bidder was a mysterious Mongolian company known as Avar that was using an address in Ulan Bator but had no presence at the building and had never previously purchased a property in Japan. Analysts believe it was a front for the North Korean government. That transaction was blocked by authorities in Japan for a lack of transparency, triggering a third round of bidding. Pyongyang, April 11 (KCNA) — Supreme leader Kim Jong Un sent educational aid fund and stipends amounting to 207.8 million yen to the General Association of Korean Residents in Japan for the democratic national education of children of Koreans in Japan on the occasion of the 102nd birth anniversary of President Kim Il Sung. The educational aid fund and stipends sent by Generalissimos Kim Il Sung and Kim Jong Il and Marshal Kim Jong Un in 160 installments total 47,331,150,390 yen. Since the Mangyongbong-92 is no longer traveling the East Sea/Sea of Japan, I wonder how the funds will be transferred. 1. 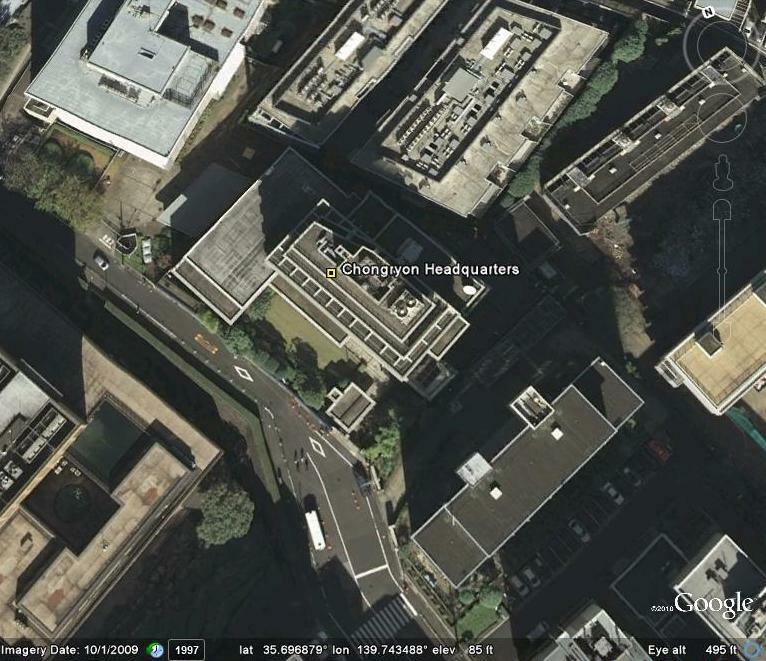 Chongryun headquarters in central Tokyo was recently auctioned off for debts incurred helping the DPRK get through the Arduous March. 2. Chongryon schools are not eligible for some Japanese education subsidies. Pyongyang, March 29 (KCNA) — The Committee for Aiding Overseas Compatriots of Korea made public a statement on Friday denouncing the Japanese authorities for their extremely dangerous moves to stifle the General Association of Korean Residents in Japan (Chongryon) and Koreans in Japan. On March 24 the Japanese authorities took such fascist action as instigating the Tokyo District Court to make an illegal decision to allow the sale of the land and building of the Korean Hall of Chongryon. The Japanese authorities are feigning ignorance of the fact, noting that the decision was made by a “judiciary organ” in a bid to evade the blame for seizing the Korean hall. But this is no more than an excuse to cover up their sinister criminal purpose. It is their sinister political scenario to deprive the Central Standing Committee of Chongryon of the base of its activities and thus weaken the authority of Chongryon, a model of Juche-based overseas Koreans’ movement, and dampen the elated patriotic enthusiasm of Koreans so as to stamp out the movement of Koreans in Japan. Now that the Japanese authorities deliberately touched off distrust at a time when confidence-building is required for improving the DPRK-Japan relations more urgently than ever before the DPRK is compelled to take corresponding measures. If the Japanese authorities persist in their moves to seize the Korean Hall despite the warning of the DPRK, they will be wholly responsible for the consequences to be entailed by them. Pyongyang, March 29 (KCNA) — The Tokyo District Court made a decision to allow the sale of the land and building of the Korean Hall of the General Association of Korean Residents in Japan (Chongryon) under the backstage wire-pulling of the Japanese authorities. The spokesman for the Democratic Lawyers Association of Korea Saturday released a statement disclosing the illegality of the decision. The illegality of the decision finds its vivid manifestation in that the court selected a disqualified company as a successful bidder by fraud and swindle. The Tokyo District Court had delayed the announcement of the results of auction of the Korean Hall of Chongryon, which was made in October of 2013. On March 20, it reopened the tenders for it for no reason all of a sudden and made the decision to allow the sale to the Marunaka Holdings Co. Ltd., Japan. As far as the above-said company is concerned, it had already been disqualified as it underbid others in October last year and took back bid bond from the court. In particular, it is a precedent of the Japanese courts that in case the relevant court returned the bid bond to a disqualified company it would not make a decision to allow the sale to it. Therefore, it was a crude violation of the law in every aspect that the court chose the above-said company as a successful bidder. The illegality of the decision of the Tokyo District Court is also evidenced by the double-dealing attitude of the Resolution and Collection Corporation, a creditor. When the issue of the Korean Hall presented itself, the Corporation made a hostile and discriminating demand that Chongryon should repay a total amount plus interest though it has settled issues with other debtors in a friendly manner. But the Corporation kept mum about the decision of the Tokyo District Court to sell the Korean Hall at a price less than half the actual one. The Japanese authorities has long regarded the Korean Hall of Chongryon on which the flag of the DPRK is fluttering as a thorn in their flesh and run the whole gamut of plots to seize it. The Democratic Lawyers Association of Korea categorically rejects the decision of the Tokyo District Court and declares internally and externally that the illegal decision is invalid, the statement says. The Japanese authorities had better halt their moves to seize the Korean Hall, though belatedly, if it thinks of its face as a “law-governed state” even a bit and has real intention to improve the relations with the DPRK, the statement concludes. A court ruled Monday that a Japanese estate agency could buy the Tokyo property that serves as North Korea’s de facto embassy, after an earlier bid fell through. The decision from the Tokyo District Court drew an immediate and angry reaction from Chongryon, the organisation that represents North Korean interests in Japan in the absence of diplomatic ties. “This is an unfair decision. We cannot accept it,” said an organisation spokesman, adding that an appeal would be lodged. The site — a 2,390-square-metre (25,725-square-feet) plot and 10-storey building occupied by Chongryon — was put up for auction after it was seized by authorities over unpaid debts. Monday’s ruling gave real estate firm Marunaka Holdings the right to buy the building for 2.21 billion yen ($22 million), after a winning bid from an obscure Mongolia-registered company fell apart. The Avar Limited Liability Company had won an auction in October with a bid of 5.01 billion yen, beating Marunaka’s offer. But the court disqualified the offer several months later reportedly due to flawed documentation amid questions over whether the firm had links to Pyongyang. Japanese law bars an organisation forced to sell assets from taking part in an auction of them. The Japanese firm is planning to remove the North Korean-linked organisation from the property, reports said, but it was unclear if it still planned to go through with the purchase following the judgement. Hundreds of thousands of ethnic Koreans live in Japan, mostly a legacy of those who emigrated or were forced to move to Japan during its 1910-1945 colonial rule of the Korean peninsula. About 10 percent are believed to be affiliated with Chongryon, which charges that the community is persecuted by authorities and harassed by right-wing activists. UPDATE 4 (2014-1-23): NK News reports that the mysterious Mongolian firm has been blocked from purchasing the former headquarters building. A Japanese court has blocked a Mongolia-based company’s bid to buy the Tokyo headquarters of the main pro-North Korea organization in Japan, Chongryon. After months of screening, the Tokyo District Court announced on Thursday that due to purchase irregularities it would not allow the Ulan Bator-based Avar Limited Liability Company to purchase the property, which still serves as the headquarters for Japan’s main pro-North Korea organization. The Mongolian firm, which had previously won an October 2013 auction for the building with a 5.01 billion yen (U.S. $48 million bid) bid, was rejected by the court because a certificate it submitted to support the purchase appeared to be a color photocopy and did not bear the official seal of the Mongolian government. “It is a company on paper,” Hideshi Takesada, an expert on regional security at Takushoku University in Tokyo, told NK News on Thursday. “With the bid tendering highly unlikely to be successful, Chongryon will be able to stay at the headquarters building and use the land. In a sense, the Japanese government is doing a favor for North Korea,” Takesada said. Takesada is a former executive director of the National Institute for Defense Studies in Tokyo, the Japanese Ministry of Defense’s think-tank. The Tokyo District Court acted yesterday in response to a petition for an injunction on the sale filed by Ken Kato, director of Human Rights in Asia. Kato’s request pointed out that would-be buyer Avar was registered at an address in Ulan Bator, but the company apparently had no presence there. When a Japanese television team arrived at the Mongolian address to ask about the purchase of the 10-storey building that is now occupied by Chongryon, the organisation that represents North Korean residents of Japan, and the prime plot it occupies in Chiyoda Ward, they were met by a bemused woman. She told the TV crew her family had been living in the apartment for seven years and had never heard of Avar. No deadline has been set for the court to make a decision on whether the transaction will go ahead, but Kato is confident any investigation will lead back to the North Korean leader. “Kim Jong-un wants to save face and not lose this property and I’m sure the decision to pay more than the market value is a case of a dictator’s whim,” he said. The minimum price for bidders for the property was set at 2.13 billion yen (HK$168 million), while a previous deal to buy the building in May for 4.52 billion yen fell through when the buyer, the chief priest of Saifukuji Temple, was unable to raise the funds by the deadline. Kato said it was therefore curious that the latest sale price was 5.01 billion yen. “The buyer could have got it for a lot less than that and I believe they offered so much in the hope no answers would be asked and the real purchaser could remain anonymous,” he said. That was always likely to be a vain hope, given the interest in the property, which was put on the market in March by the government-backed Resolution and Collection Corp. in an effort to recoup loans of 62 billion yen that it extended to the residents’ association after the collapse of a number of financial institutions for North Korean residents of Japan. The involvement of a Mongolian firm also raised eyebrows in Japan, as no Mongolian firm has ever purchased a building in Tokyo and there are very few Mongolian companies with enough cash to carry out such a deal. As well as the suggestion that Avar is a front company for the North Korean regime, there has also been speculation that the Mongolian government might be involved as part of the burgeoning relationship between the two regimes. The Kagoshima temple offered ¥4.5 billion, the highest among four bidders, to acquire the land and the Chongryon building. “We will keep the building as it is and make it a base of harmony among ethnic groups in Asia, including North Korea,” said Saifuku Temple leader Ekan Ikeguchi. The government-backed Resolution and Collection Corp. put the premises out to tender to recoup loans of about ¥62.7 billion it made to Chongryon. Bidding has begun for the repossessed central headquarters of the General Association of Korean Residents in Japan, North Korea’s de-facto embassy in the country. It’s an attempt by the Japanese government to get back some of the ¥62.7 billion owed by the pro-Pyongyang group, also known as Chongryon, and comes as the reclusive regime faces a new round of sanctions and international condemnation following its third nuclear test. Built in 1986, the 10-story office building has two basement floors and is situated on a 2,390 square-meter piece of land in a prime location in central Tokyo. The Tokyo District Court said in its assessment of the building that some portions of it showed signs of age-related deterioration as well as damage incurred during the massive 2011 earthquake that shook northeastern Japan. Analysts say that as the auctioneer’s hammer falls, so falls the fortunes of the once-influential group. “Losing its central headquarters is symbolic of Chongryon’s decline,” said Hajime Izumi, Professor of International Relations at Shizuoka University. “While the organization will survive, I expect it to face increasing difficulty maintaining itself,” he said. Founded in 1955 as an organization representing the pro-North Korean members of Japan’s ethnic Korean minority, Chongryon has been responsible for pumping out North Korean propaganda and has been operating banks, a newspaper and numerous schools for Korean residents in Japan. The group has also been a reliable source of hard cash for Pyongyang, with members sending back a large portion of revenue accumulated through numerous “pachinko” gambling parlors and real-estate businesses operated across the nation. But Yoshifu Arita, an upper house lawmaker in Japan’s parliament, said the organization faced severe head-winds in 2002 when the late Kim Jong Il admitted during a meeting with then-Prime Minister Junichiro Koizumi that North Korean agents had kidnapped Japanese nationals in the 1970s and 1980s. Chongryon’s debt stems from a network of credit unions for pro-North Korean residents of Japan that collapsed and had to be bailed out by the government-backed Resolution and Collection Corporation in the late 1990s and early 2000s. The debt has been transferred to Chongryon, which has been sued by the RCC for repayment. A 72-year-old South Korean businessman living in Kobe, who used to be affiliated with Chongryon, added that the younger generation of Koreans in Japan also felt less of a link and patriotism toward Pyongyang. And with Japan’s long economic malaise following the burst of its debt bubble in the early 1990s, “pro-Pyongyang supporters don’t have the cash or the will to lend a hand to the organization, even when its headquarters are about to be sold off,” added the businessman, who asked not to be identified. Bids for the building, which began Tuesday, will be accepted through March 19. The winner of the auction, which Chongryon cannot participate in, is expected to be decided on March 29. In late June, a Japanese court ordered Chongryon, a business, education, and banking organization formally representing pro-North Korean members of Japan’s ethnic Korean minority, to auction off its ten-story office building in downtown Tokyo, effectively ending its mission of bringing money into North Korea and pushing propaganda out. The group’s problems are essentially financial: Chongryon owes the Japanese government nearly $750 million for a late-90s emergency bailout that rescued the group’s network of credit unions, which were rapidly de-capitalized because of remittances to North Korea during the country’s devastating mid-90s famine, an economic and humanitarian catastrophe that killed up to 2 million people. As with just about anything regarding North Korea, even the surface-level truth belies deeper and darker realities. If it weren’t for the chronic economic crisis and resulting famine that gripped North Korea in the 1990s, as well as a rising anti-North Korean strain in Japanese politics, then the criminal enterprises, communal bonds, and official connections that made Chongryon such a formidable political and cultural organization may well have remained intact. It took economic collapse, regional crisis, and domestic political upheaval to bring Chongryon to its knees. North Korea has no official embassy in Japan, so the Pyongyang-linked Chongryon acts as an unofficial representative of a government that has kidnapped Japanese citizens and fired long-range missiles in the island nation’s direction. It runs banks, a newspaper, dozens of schools, and a university named after Kim Il Sung, North Korea’s “eternal leader” and the current despot’s grandfather. In the 1980s, Chongryon’s business and criminal enterprises, which included off-book pachinko parlors, pubs, prostitution rings, and real estate, reportedly produced over a billion dollars a year in revenue — much of which, according to Michael J. Green of the Center for Strategic and International Studies, was sent back to Pyongyang. As late as 1990, its banking system was capitalized to the tune of $25 billion. Because North Korea has few exports and is under severe international sanctions, unofficial currency-gathering enterprises like this one can be crucial. And the group also serves as a propaganda outlet, pushing out the DPRK party line to ethnic Koreans. It would be unimaginable for North Korea to own a K-Street high-rise, and South Korea officially bans any expression of support for its northern neighbor. But Japan has allowed its enemy’s outpost to remain, and even thrive. The full story is well worth reading here. Here are previous posts on the Chongryon including a post from 2010 when the Japanese Supreme Court ruled that the headquarters could be seized. After North Korea’s launch of a long-range rocket in December 2012 and third nuclear test in February 2013, China endorsed UN sanctions against North Korea. Consequently, North Korea appears to be increasing its economic cooperation with Mongolia and Russia. On September 6, the 7th annual Northeast Asia joint high-level forum was held in Changchun (Jilin Province), China. Ku Bon Tae of the DPRK Ministry of Trade is reported to have been present and to have delivered a presentation on North Korea’s recent economic cooperation activities. In May, a Mongolian oil companies HB Oil JSC acquired 20 percent stake in North Korea’s state-run Sungri oil refinery. In July, the two countries signed an agreement on information and communication cooperation and exchanges. In addition, Mongolian experts in the field of livestock are said to be involved in North Korea’s Sepho tableland (Gangwon Province) reclamation project, which seeks to create a large stockbreeding complex. As for economic cooperation with Russia, the Khassan–Rajin railway — part of an international container rail transport line connecting Russia and North Korea and linking Northeast Asia to Europe — has its opening ceremony scheduled for this month after having received extensive reconstruction. Russia also has a long-term lease on Rajin Port’s pier No. 3. Russia has been renovating the pier, and renovations are expected to be completed by the end of this year. North Korea and Russia plan to develop Khassan–Rajin rail line and Rajin Port in order to transport cargo from Asia to Europe: as containers arrive at Rajin Port, they are moved to the Khassan-Rajin railway and then transferred to the Trans-Siberian Railway (TSR), headed for Europe. In Ku’s speech, the public economic cooperation with regards to China was covered briefly, and exclude the recent progress made. He commented only on the establishment of Joint Management Committees in Rason and Hwanggeumpyeong economic zones and that banks of the two countries are in the process of negotiating the usage of Chinese renminbi as the currency of trade. The 9th China–Northeast Asia Expo opening ceremony was also held (in Changchun) on the same day as the forum. Political and business leaders from China, South and North Korea, Russia, Japan, and Mongolia were present at the event. In May, a Mongolian oil company HB Oil JSC acquired 20 percent stake in North Korea’s state-run Sungri oil refinery. In July, the two countries signed an agreement on information and communication cooperation and exchanges. In addition, Mongolian experts in the field of livestock are said to be involved in North Korea’s Sepho tableland (Gangwon Province) reclamation project, which seeks to create a large stockbreeding complex. North Koreans carrying diplomatic passports were caught smuggling medicine by Mongolian customs officials, a report said Tuesday. The UB Post monitored in Seoul said two people caught were on an international train running between Beijing and Ulan Bator. It gave no names, but said inspectors discovered large amounts of products in their baggage, including a thousand boxes of injection medicine, 12 boxes of bear spleen products and 20 bottles of alcoholic beverages. The English language newspaper said those implicated in the illegal transport could not be identified as being incumbent North Korean diplomats. The cash-strapped North has used its diplomats in the past to smuggle goods. From 2009 onwards, three cases have been reported with the last scandal involving a diplomat stationed in Pakistan, who was caught trying to sell alcohol. A diplomatic observer said if the two people who are currently being questioned by Mongolian police are real diplomats it could sour relations between Pyongyang and Ulan Bator. Economic cooperation between North Korea and Mongolia is increasing. In July 2013 alone, Mongolian authorities made two trips to North Korea, actively displaying exchanges between the two states. According to North Korean media, on July 3, 2013 a Mongolian delegation representing information and technology, postal, and communication industries signed an agreement with North Korea to promote exchanges and cooperation in the IT sector. On July 15, Lundeg Purevsuren, national security and foreign policy advisor to the Mongolian president, and Avia Baatarhuyag, director general of the Mongolian News Agency, visited North Korea. Last month, Mongolian oil trading and refining company HB Oil JSC acquired a 20 percent stake in the North Korean state-run entity operating North Korea’s Sungri Refinery, representing the first purchase by a Mongolian-listed company of a foreign asset. In particular, one of North Korean leader Kim Jong Un’s focal projects is the development of the Sepho tableland (in Gangwon Province) into a large-scale stockbreeding base. North Korea is reportedly cooperating with Mongolian experts in the livestock industry in this regard. North Korea and Mongolia are strengthening economic cooperation as national interests of the two states overlap in many areas. As Mongolia is a landlocked country, Ulaanbaatar wants to take advantage of North Korea’s Rajin Port as a conduit to export Mongolia’s natural resources to foreign countries since access to the East Sea via use of the port can significantly reduce transportation costs. In November 2012, when North Korea’s Supreme People’s Assembly Chairman Choe Tae Bok visited Ulaanbaatar, Chairman of the Mongolian Parliament Zandaakhuu Enkhbold expressed interest in cooperating with North Korea in trade, IT, and people-to-people exchanges and affirmed Mongolia’s interest in use of the harbor. In response, Chairman Choe also conveyed North Korea’s interest in leasing the harbor, as well as in cooperating with Mongolia in the coal and mining industries. North Korea is promoting the development of Rajin Port as an international harbor to attract foreign investment, including Mongolian investment. In addition, as a means of earning foreign currency, North Korea sends a large number of workers to Mongolia to work at construction sites. Radio Free Asia (RFA) reported on July 3 that there were 1,749 North Korean workers dispatched to Mongolia as of April — the second largest group of foreign laborers in Mongolia (second only to the Chinese at 5,976 workers), which has a total of 12,064 workers from 103 countries. North Korea and Mongolia established diplomatic relations in 1948. Pyongyang closed its embassy in Ulaanbaatar in August 1999 for economic reasons, but re-opened it in August 2004. A total of 1,749 North Koreans are working in Mongolia with most of them employed in the construction sector, a news report said Wednesday. The number of North Korean workers, tallied at the end of April, accounts for the second largest foreign workers’ group in the central Asian country, after the Chinese, the Washington-based Radio Free Asia said, citing Mongolia’s labor ministry. The figure represents North Koreans legally working in the country. Chinese workers in Mongolia stood at 5,976 as of end-April, it said. Given that most foreign workers in Mongolia are employed in the construction industry, the majority of the North Korean workers are presumed to also work in the sector, the report said. A previous report by a Mongolian newspaper has quoted a North Korean laborer in the country as saying that an average North Korean worker receives US$600-700 in monthly wages there. The report reflects the two countries’ recent efforts to tighten economic ties. The Mongolian oil firm HBOil JSC announced last month that it has acquired a 20 percent stake in the North Korean oil refinery Sungri. Mongolia also expressed its hope to rent a North Korean seaport while Choe Thae-bok, the chairman of the Supreme People’s Assembly, was visiting the country in November last year. You are currently browsing the archives for the Mongolia category.